Arrive for a full welcome reception at Boston's Harpoon Brewery - founded by three college friends in 1986 who wanted to replicate the wonderful beer culture of Europe! Enjoy a catered BBQ dinner on arrival, delicious pretzels made on site and a brewery tour and beer tasting after your meal! Additional beer and hard cider may be purchased on own. Depart for Embassy Suites by Hilton (Two Nights). Guests will check into a completely renovated property only 1 1/2 miles to downtown Boston and right on Boston's "T" subway transportation line. Check in and have the evening to explore on your own. 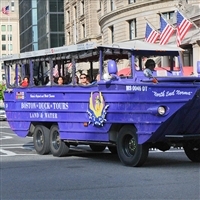 Enjoy a full hot breakfast and meet to climb aboard a Boston "Duck" for a unique land and water tour of Boston on authentic, renovated WWII amphibious vehicle. This narrated tour will include historical information, little known facts, interesting insights and lost of fun! Climb off the duck and experience a "Yummy Walk" of the Freedom Trail as you view and visit historic sites from Colonial and Revolutionary times, you will discover Boston's culinary history too! This one-mile walking tour, is easy walking with multiple stops where guests will enjoy numerous Boston specialities. Passengers will have the afternoon and early evening on their own to explore downtown Boston and visit Quincy Market, Boston's #1 tourist attraction - featuring shops, boutiques, pushcarts, street entertainers and the famous food court with specialties to suit any taste. Enjoy dinner on your own before meeting for a fully narrated 90-minute sunset cruise of Boston Harbor. Enjoy the history, sights and lore. Witness the USS Constitution's sunset ritual as she fires her cannon and lowers her flag ceremoniously signaling the day's end. Enjoy a full hot breakfast at leisure before checking out and departing for Fenway Park. Passengers will enjoy a guided walking tour of historic Fenway Park, home of the Boston Red Sox, the oldest Major League Baseball Stadium, open since 1912. See the press box, luxury suites and the infamous "Green Monster." Hear about the "curse of the Bambino" and see where Ted Williams longest hit landed! After the tour, enjoy an included Fenway Frank, Chips and water before returning home. Two Nights Lodging, Two hot breakfast's, Harpoon Brewery Tour & Beer Tasting including a BBQ Dinner, Boston Duck Tour, Yummy Walk of the Freedom Trail (Multiple food tastings), Sunset Harbor Cruise of Boston Harbor, Guided walking tour of Fenway Park including a Fenway Frank, chips and water.